The school year starts in September and ends in June. Students can attend summer school if they have had bad results during the year, or just to improve their level. Repeating a grade is very rare. "I pledge allegiance to the flag of the United States of America and to the Republic for which it stands : one nation under God, indivisible, with liberty and justice for all." Classes last from 40 to 55 minutes, and end around 3 pm. The curriculum [programme]: students have to study compulsory subjects (generally math, English, sciences) and choose among a range of optional courses (history, geography, languages ...). 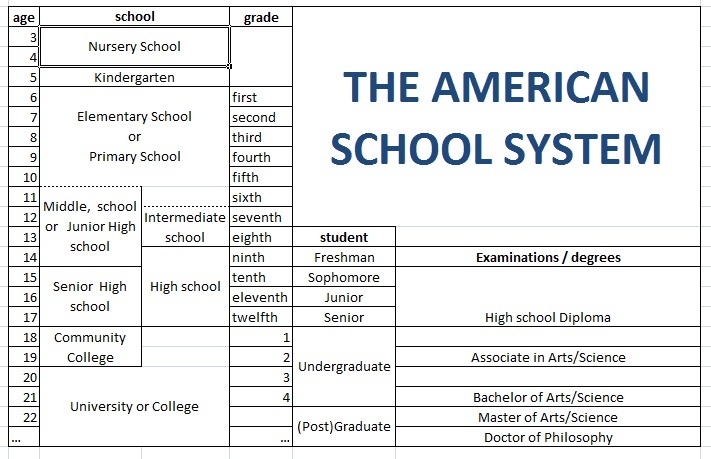 Results in tests take on the form of five letter grades: A, B, C, D, and F—A being the highest and F, denoting failure, the lowest. Students who pass the 12th grade receive a high school diploma. At the end of 12th grade, the students go to a big dance, called the "prom"
Universities are usually large in size and always offer undergraduate and graduate programs. Colleges may offer the same programs as universities, but often they do not have graduate programs. Junior Colleges (also called Community Colleges) offer only two-year programs. Universities or colleges are autonomous and compete for the best students. The value of their degrees depends on their fame. the knowledge acquired in high school . a major subject and a minor one in relation. These studies lead to a BA or BSc (Bachelor of Arts or Science). and after two or more years to a Doctorate (a PhD). State Universities : Each state has its own system of public higher education and at least one state university. The President and the Governing Board are appointed by the Governor of the state. 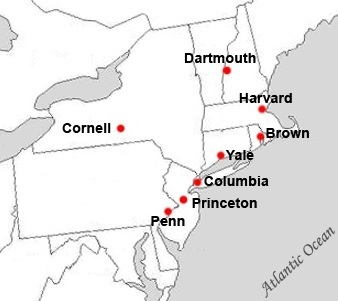 Each one has at least one campus managed by a Chancellor. and Professional Schools (Business, Medicine, etc.). Higher education is not free. State universities are cheaper for the students from the state (2009 annual average: $7,020), but otherwise, tuition is comparable to private school prices. Annual graduate program tuition can vary from $15,000 to as high as $50,000. Note that these prices do not include living expenses (rent, room/board, etc.) or additional fees that schools add on such as "activities fees" or health insurance. The great private universities are the most expensive. or to a scholarship granted by a local authority or by the state on the basis of merit and need. Part-time jobs are also a solution for a majority of students. The year is divided into three terms or two semesters. 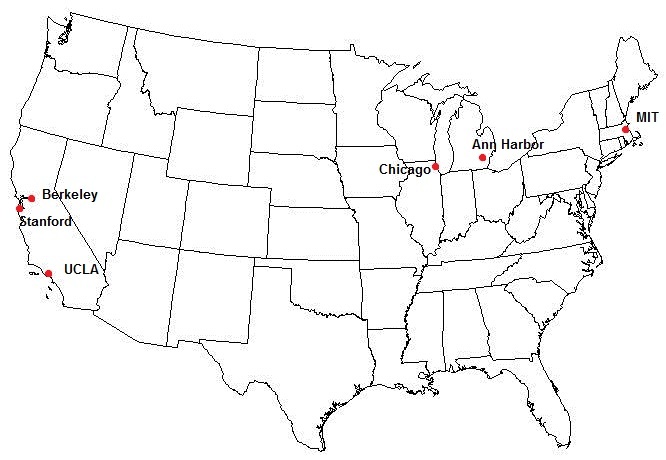 the University of Chicago (Illinois).